As people should know, the "virtual office" or "virtual bar" (depending on the time of day) where devs and users hang out is the IRC chat room generously provided by codehaus.org. Go to here and click on the "Server" link. 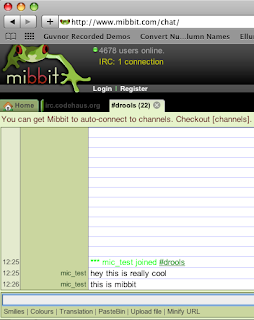 Enter irc.codehaus.org as the server address, and #drools as a channel, and a short nick name (< 8 chars please !). Drools a reflection on 5 years.